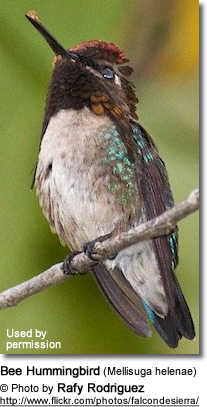 The Bee Hummingbird (Mellisuga helenae) - also known as Zunzuncito or Zunzún hummingbird within its natural range - is a tiny bird that is only found in Cuba - a Caribbean island south of Florida, USA, and possibly on nearby islands. 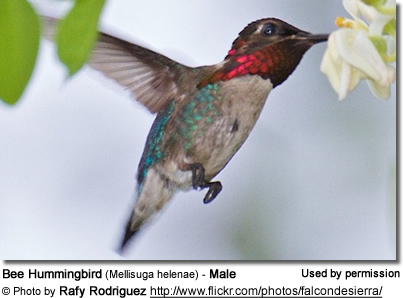 The Bee Hummingbird naturally occur in Cuba - a Caribbean island situated south of Florida, USA; with patchy populations found in Habana (the capital of Cuba), Sierra de Anafe, Guanahacabibes Peninsula, Zapata Swamp, Moa, Mayarí and the coast of Guantánamo. ud (formerly known as the Isle of Pines) - the largest of the islands off Cuba's southern coast. However, there are some reports that these tiny birds are now extinct on that island. There have also been several bee sightings on the neighboring islands of Jamaica, Haiti. (Lack, 1971; Tyrrell, 1990) and Santo Domingo. 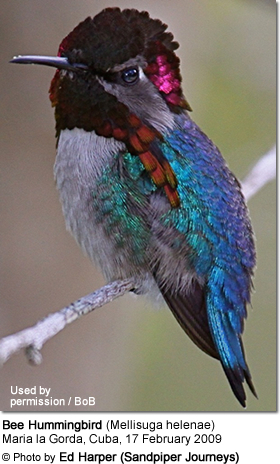 However, some experts feel that these were instead sightings of the similar, yet larger, Vervain Hummingbird. 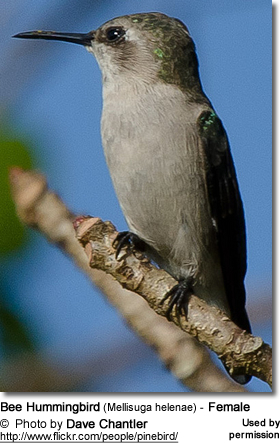 They are also said to be vagrants to the Bahamas (an island group north of Cuba. 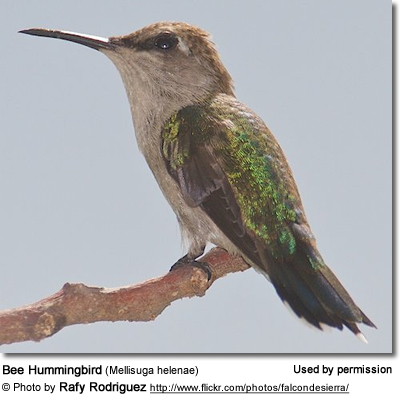 In 2015, Lourdes Quiterio - a park ranger for the state of Florida - reported a female bee hummingbird feeding in Delnor Wiggins Pass State Park located in Naples, Florida. Photos were taken. These birds are mostly resident (non-migratory) as the humid subtropical climate they live in, with no seasonal extremes, optimally meets their needs. 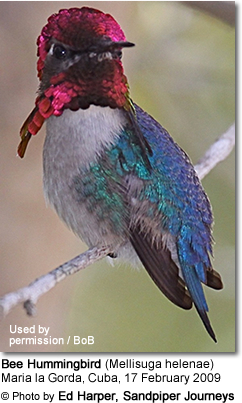 Therefore, there really is no need for them to migrate long distances, as other hummingbirds do. However, they will make movements in response to differing flowering seasons. These birds primarily inhabit dense coastal forests and forest edges, but are also found in mountain valleys, interior forests, swamplands and gardens. They prefer areas with the plant Solandra grandiflora - a vine with large ornamental flowers - and their preferred source of nectar. Even though, they appear to live at both high and low altitudes, They seem to prefer lowland areas. 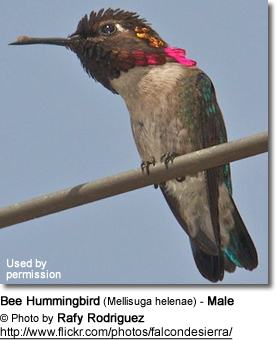 The Bee Hummingbird was formerly common and widespread, but is now rare and localized. The principal threat to its existence is habitat loss. Large parts of Cuba's natural vegetation has been converted for agricultural uses, with only 15-20% of land remaining in its natural state. This form of human encroachment has negatively impacted the subtropical and tropical forests and swamplands that sustain this bird, and it is now confined to ever-shrinking suitable habitats. As a result, its numbers have been declining in recent years and these birds are now classified as Near Threatened. Bee hummingbirds are the smallest known living birds in the world - being comparable in size to bumble bees and are lighter than a Canadian or U.S. penny. Females are slightly larger than males. 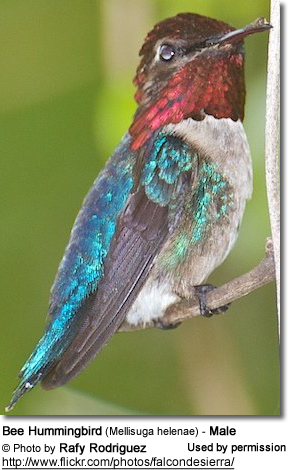 They measure mostly between 1.97 - 2.36 inches or 5 - 6 cm in length - including beak and tail; and they weigh between 0.06 - 0.07 oz or 1.6 - 1.9 g. Compare this to the largest hummingbird is the giant hummingbird of South America, which is 8 inches or 20 cm long and weighs around 0.70 ounces (20 grams). 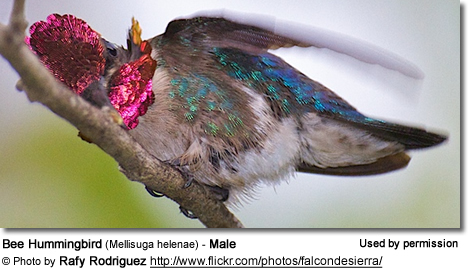 The breeding male has a glossy red-pink head, chin and throat, and an iridescent gorget (throat patch) with elongated lateral plumes. His upper plumage is bluish, while the rest of the under plumage is mostly greyish white. His colorful plumage can only be seen during breeding season and is shed shortly afterward. The non-breeding male looks like the female but their outer tail feathers are black-tipped (rather than white). There also have blue spots on the wingtips. The female's upper plumage is bluish-green; and her plumage below is whitish / pale grey. Her outer tail feathers are white-tipped. 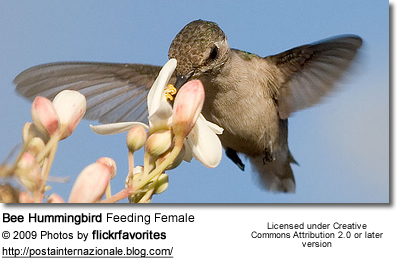 Vervain Hummingbirds are similar to the female and juvenile Bee hummingbirds. 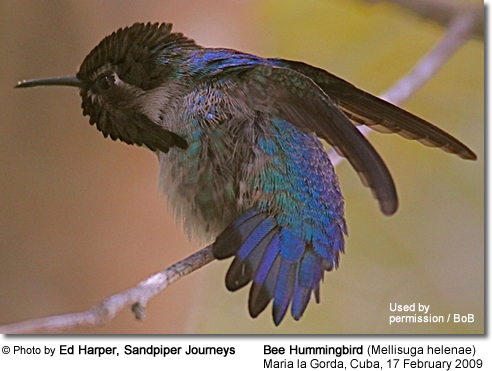 However, apart from the fact that their ranges don't meet, the Vervains are slightly larger than the Bee hummingbirds; additionally, the latter can be identified by the fact their more bluish-tinged back feathers. They primarily feed on nectar taken from a variety of brightly colored, scented small flowers of trees, herbs, shrubs and epiphytes - visiting up to 1,500 flowers on an average day. They favor flowers with the highest sucrose concentrations 15 to 30 percent - their favorite feeding plant being the Solandra grandiflora (Cup of Gold Vine, Chalice Vine). These hummingbirds seek out, and aggressively protect, their favorite feeding areas. They use their long tongues to retrieve the sweet nectar while hovering with their tails cocked upward as they lick at the nectar up to 13 times per second. At times, they are observed hanging on the flower while feeding. They spend most of the day feeding as they have to eat half their total body mass and drink eight times their total body mass in water each day to support their high metabolism. The breeding season usually commences at the end of the wet season and the onset of the dry season, when many trees and shrubs are flowering -- in particular their favorite feeding plant - the Solandra grandiflora (Cup of Gold Vine, Chalice Vine). These birds are solitary in all aspects of life other than breeding; and the male's only involvement in the reproductive process is the actual mating with the female. They neither live nor migrate in flocks; and there is no pair bond for this species. For all aspects of life other than breeding, these birds tend to live a solitary existence. He will separate from the female immediately after copulation. The males do not participate in choosing the nest location, building the nest or raising the chicks. The female is responsible for building the small cup-shaped nest out of plant fibers (about 1 inch or 3 cm in diameter), woven together and green moss on the outside for camouflage in a protected location in a shrub, bush or tree. She lines the nest with soft plant fibers, animal hair and feather down, and strengthens the structure with spider webbing and other sticky material, giving it an elastic quality to allow it to stretch to double its size as the chicks grow and need more room. The nest is typically found on a low, thin horizontal branch between 3 to 20 feet from the ground. The average clutch consists of two pea-sized white eggs, which she incubates alone for 14 to 16 days, while the male defends his territory and the flowers he feeds on. The young are born blind, immobile and without any down. The chicks are brooded only the first week or two, and left alone even on cooler nights after about 12 days - probably due to the small nest size. The chicks leave the nest when they are about 18 to 38 days old. The young will start breeding when they are about 1 year old. These small birds make a variety of simple, high-pitched songs typically consisting of a single repeated note, each note lasting less than a second. Their vocal sounds include squeaking and twittering.